What Thursday already! - and Thursday evening at that! Where has the week gone? I've been to the Archives twice and the Cudworth Group twice, a CAMRA meeting and a talk in Sheffield ... anyone would think I'm able bodied ... although I did have to leave the Monday meeting after about half an hour 'cos it was far too flipping cold in the library. At least the Archives is nice and temperature controlled, think of all the gas money I'm saving sitting in there two days a week! Tomorrow is a day off, I'm waiting in for the postman to bring my new glossy flyers. You can download a copy here. Please note I need to do at least two talks now this year to pay for the flyers! So if you live anywhere near Barnsley and are looking for an entertaining speaker please read all about what I can offer - the same words, more or less, can be found on my History Talks tab at the top of this page. I began with an inventory taken of the contents of the Coach & Horses, Sheffield Road, Barnsley made in 1843 on the death of the landlord, William King - that's not the fake Tudor building that's there now (which is currently being turned, very slowly, into a restaurant), but an earlier low stone built building. You can see it in the middle distance in the photo above left. Remember that if you click on the images they open up much larger in a pop up window. The detail of these documents is such that you can imagine walking into the pub and making your way around the building. In the front room there was seating around the room, a backed form and three chairs with wooden seats plus thirteen(!) iron spittoons. Then you go through into the bar where there are another three chairs, a black deal form, a stove with pipe and lots of glasses (tumblers, tots, wine), pint pots (which I guess were actually pot!) and some pitchers - maybe for fetching the beer and spirits from the cellar. The house (I know people who still call their back room or living room the house) contained two long backed settles, a backed seat, an oak table with deal forms around it, a clock in an oak case, a brass hearth grate, fender and fire irons. Sounds like the best room doesn't it? In the kitchen there was a cheaper deal table, some more chairs and another form, pails and cans, a kettle, milk can, potato crusher (mashed potato 1843 style! ), a paste board (for rolling pastry I guess) and then some beer related items, a malt mill, three casks and fourteen brass taps. The cellar contained the beer (780 gallons) and the spirits including whiskey, gin, rum, brandy and peppermint. Alcoholic peppermint? OK, I've not heard of that before ... but they've only got a gallon of that, maybe it's a cordial similar to Crème de Menthe? There are items in the outbuildings which confirm the pub did its own brewing, and finally the livestock is enumerated, a cow and a sow ... the cow provides milk and the pig is being fattened up I suppose. In 1843 there wasn't anything much around the pub, judging by the map from 1852 (which was a bit boring so I've given you an 1889 snip in the picture above). Two houses immediately adjacent, absolutely nothing where the Victoria is now and nothing on the other side of Sheffield Road either, just a small house diagonally opposite, which has been replaced by a larger one by 1889. Plenty of room for the cow and the pig! The second inventory I looked at was a lot more upmarket. 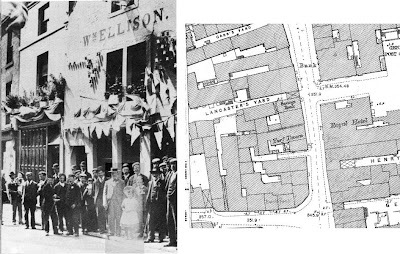 The Turf Tavern site doesn't exist at all today - looking at the location map you can see that it was opposite the Royal Hotel, that's still there. I would guess it's just about under the new Barnsley Pals Centenary Square or rather the road in front of it, because of course it's much wider now than it was back then. Let's go in ... the windows at the front have painted blinds with the words 'Spirit Vault' lettered on them. There is a gas pendant with a tin shade (wow! gas lighting in 1844, I hadn't realised). There is a bar counter in this pub with sliding doors and drawers and some glass shelves too. It sounds very like a pub you might still see today. A fender and fire irons, so there is an open fire, a square table, eight wooden seated chairs and a sofa! On the shelves (I guess) are tumbler glasses, wine glasses, a punch bowl and ladles, some 'plated' pints - not sure what that means but I'm mentioning it so you know there was beer too. A tea-tray contains a sugar basin and tongs, some pewter spirit measures and a on the bar back are three spirit casks. There's a second front room too, even more comfortable, it contains a mahogany dining table which is 11 ft long accompanied by six single and two arm chairs. There's a brass fender and two bell pulls, for summoning the staff we presume? This sounds like a dining room - I wonder if I can find some advertising for it in the Barnsley Chronicle to confirm this. I think if you want a nice simple pint of beer, away from the spirits, you have to move further back in the building. The middle room contains deal forms attached to the walls, two long settles and one high backed one 9ft long which forms a passage - so you can pass through this room without disturbing the customers. There is an oak table and five wooden seated chairs, curtains to the windows (it must look out into the courtyard at the side) and ale pitchers, quart pitchers and twenty five pint pots. I imagine the beer has to be fetched from the bar back to this room. In the cellar I noted that there were 'Two pull beer machines with lead piping and union joints", so they were using hand pulls to get at least some of the beer upstairs, just like a modern pub! This room has a gas pendant too, although four brass and two iron candlesticks are also listed along with 2 pairs of snuffers - those will be for putting out the candles in a decorous manner, no messy blowing in this posh establishment! The next room listed is the 'Glass-room', now this is intriguing ... if you look again at the map snip there's a little square of hatching (denoting a glass roof) to the right of the courtyard, like a conservatory! This room contains six wooden seated chairs and a round oak table, a large deal settle, a tin fender (not as posh as the brass one at the front then) and a drugget. I had to look that up, it's a kind of rough material used as a rug ... I wonder why there's a rug mentioned in here and not in the other rooms? Maybe the floor is cold! The kitchen contains everything you might expect, and some you might find surprising. How about an Ale-warmer or two jappaned cheese tins? There are cooking tins, dripping pans, a coffee mill and a frying pan, and (why don't we still have these?) a boot jack! This pub brews on a much larger scale than the Coach & Horses, there's a dedicated brew-house containing a copper, mash tubs, a ginger beer tub (yes, ginger beer was definitely alcoholic in those days), buckets, shovels, a barrel-washer-tub and a barm trough (that's for the yeast). There's less stock in trade in the Turf, but that's probably because this inventory was taken, not when the landlord had died, but on the transfer of the pub from one man to another. 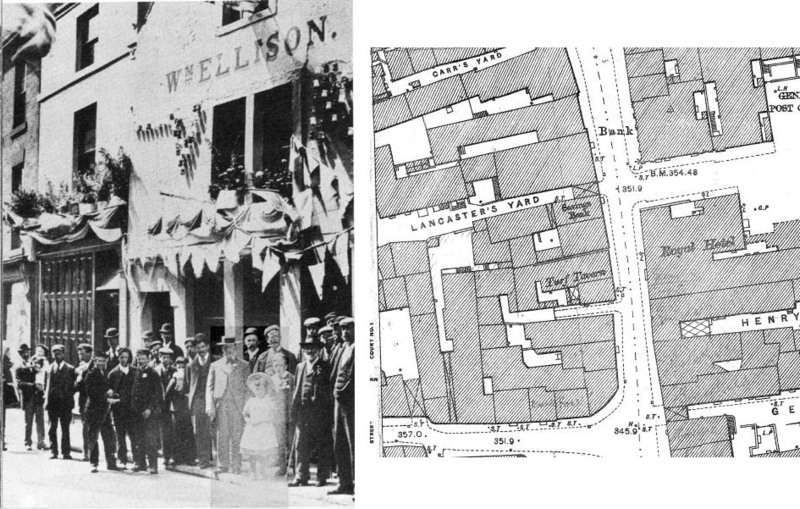 William Hall is handing over to Joseph Overend who remains in the pub until 1863 according to the information in Barnsley Streets vol 1. There's so much more I could do with this information, I need to find the pubs on the census and find out if the landlords had families or live in staff. How old were they, did they have second jobs? I'm really getting a picture of what pubs in Barnsley were like 170 years ago. This really is a lot of fun ... well it is for me, I'm combining my two favourite hobbies, history and beer. Wonderful! How fascinating! Don't forget that Joseph Bramah, who is supposed to have invented the beer engine, was a Barnsley man. I wonder when he lived? Maybe his beer engine was in the Turf Tavern - or maybe it was a precursor? Very interesting! I can see how you would get caught up in this sort of information. I've read the term "deal" many times in British books and have no idea what that means. Can you explain? I assume the "paste" board was for rolling out pastry for pies - hot pot-type stuff. Is that correct? Very thorough and absorbing work. Chris - according to this website Joseph Bramah invented the beer engine in around 1785 http://www.thisdayinwine.com/9th-may-joseph-bramah-invented-the-beer-pump-handle-today-1785/ so the one in the Turf shouldn't have been a surprise really - you just don't think of these things when you imagine an early Victorian pub. Kat - as far as I know 'deal' was a generic term suggesting cheap and cheerful, probably a softwood such as pine, something that was easy to saw and form into tables and benches etc. Your interpretation of the 'paste board' matches mine! Great minds think alike. A lot of the words used in the inventories were archaic - but then it was 170 years ago!! 'Plated pints" would be silver-plated mugs - quite common through past the end of the 19th century, generally with the pub's name on the bottom. Chris Ramsbottom - it's a bit of a myth that Bramah invented the beer pump, the one he is credited with is nothing like the modern beerpump, and almost certainly nothing like the ones at the Turf Tavern. Linda - what was the brewing equipment at the Coach and Horses? And did the inventory give any sizes for the copper and mash tubs at the Turf? Hi Martyn, I recognise your name from CAMRA circles! Thank you for the information on the plated pints - that makes sense, my OH always says beer doesn't taste right in pewter, to the extent that he's bought himself a wooden tankard for posing purposes! Can you let me have your email for a more detailed discussion on the brewing equipment? - my contact details are linked on my History Talks and About This Blog tabs. @zythophile, Hello Martyn! Your comment has shed some light on a discussion I've had on a Facebook history society page regarding "beer engines" and "beer machines". Someone commented that they weren't the same. Can you shed some light on that please?